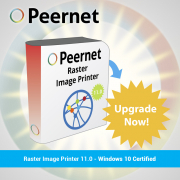 Peernet is proud to announce the release of new versions throughout most of our software portfolio! The new software versions coincide with the rollout of Windows 10, the latest operating system from Microsoft. All of our programs have been updated to work seamlessly with the new OS, in addition to containing a number of updated features that improve the user experience. Best of all, if you already own one of our products, we have some tremendous offers available. Simply log in here and click the appropriate link for big savings on your software upgrade. If not, here’s a quick look at each of our newly-upgraded products, and why they might be right for your needs! For businesses with the need for batch file conversion, Document Conversion Service (DCS) is the ideal solution. Our customers around the world commonly use DCS as an enterprise-level conversion solution. DCS allows for customizable drag & drop file conversion as well as powerful functionality like command line tools to convert files and folders, and Workflow integration. The new version of DCS allows you to convert to vector (searchable) PDF files from Microsoft Office documents. That opens up the functionality for Word to PDF, Excel to PDF, PowerPoint to PDF, HTML to PDF and much more! Creation of PDF files containing PDF graphics, embedded fonts, hyperlinks and more. Support for Windows® 10 and Windows® 10 Server. Support for Adobe® Reader DC. Improved startup of DCS service by refactoring application pool to be self regulating. Improved retry logic when a document fails to open or convert correctly. Our line of image printers makes document conversion so easy – the user simply prints a Windows document as they normally would, and just selects the Image Printer rather than a physical, in-office printer. TIFF Image Printer allows you to easily convert to TIFF using this method. PDF Image Printer provides the functionality to print to PDF. And Raster Image Printer is an all-in-one conversion solution that allows you to quickly and easily create files, converting from any printable document format to TIFF, JPEG, PDF, GIF, PNG and more. Improved page size matching when dealing with documents with custom page sizes. Printer core is now fully 64-bit when installed on a 64-bit operating system. If you need a program with the functionality of Adobe Acrobat, but at a budget that suits your needs, check out PDF Creator Plus. 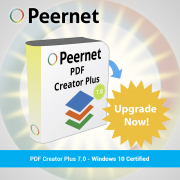 This program allows you to combine, edit and merge Windows documents to create PDF files. Improved page size matching when dealing with custom page sizes. Printer core is now fully 64-bit. An ideal time-saving product for businesses large and small, to save time and make file conversions more efficient. File Conversion Center allows you to batch convert files to PDF, JPEG, TIFF and a number of other formats. To convert files to searchable PDF format, Convert to PDF is your ideal piece of software. It easily converts any printable Windows document to a virtual PDF printer, allowing you to easily customize the quality of the conversion as well as various other settings.